World's largest displacement environment-friendly direct-injection outboard motor models Release of the New Yamaha "Z300," "VZ300" - News Releases | Yamaha Motor Co., Ltd.
World's largest displacement environment-friendly direct-injection outboard motor models Release of the New Yamaha "Z300," "VZ300"
Yamaha Motor Co., Ltd. (YMC) announces the development of the worlds largest displacement direct combustion chamber injection outboard motor models, the new environment-friendly 2-stroke outboard motor models Z300 and VZ300. Both the offshore (saltwater) model Z300 and the bass fishing (freshwater) model VZ300 will be primarily export models to be releases this autumn (2003) on the North American and other markets. 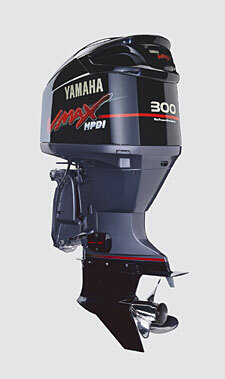 The Z300 and VZ300 feature Yamahas exclusive High Pressure Direct Injection (HPDI) technology. Taking the existing Z240 as their base model, new technologies have been added to achieve a maximum power output of 300 horsepower. These new Z300 and VZ300 become the new flagship models of Yamahas HPDI Z series which maintain the inherent 2-stroke advantages of compactness and light weight while also achieving fuel economy and cleaner exhaust equivalent to a 4-stroke. In terms of exhaust emissions, both models clear by large margins the emissions standards set by the U.S. Environmental Protection Agency (EPA) for the year 2006. These models become the first 300 hp class models in the industry to clear this standard. The entire world demand for outboard motors is said to be about 800,000 units annual, and of this the U.S. accounts for about 40%, making it by far the largest single market. 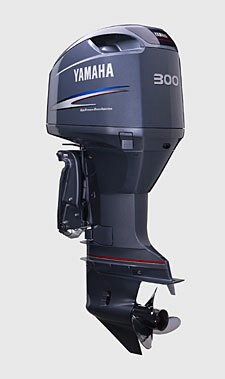 Since entering the U.S. outboard market in 1983, Yamaha has continued to expand its lineup to the point that it now offers a full and richly diverse range of both 2-stroke and 4-stroke models, among which the larger displacement models have won an especially strong reputation in offshore use, where reliability is particularly vital, and in bass fishing use. In this U.S. market, outboard powered boats are getting bigger and faster, and to get places faster and more comfortably many customers are now mounting two or even three outboards on boats in the 9-meter and larger boat class that used to be the realm of sterndrive (inboard/outboard) engines. Meanwhile, freshwater bass fishermen who fish on larger lakes are looking for outboards with performance that can take them from fishing point to fishing point faster than ever before. To answer these market needs, Yamaha has used its advanced technologies to build the industrys first environmentfriendly 300 hp outboards. Taking the existing Z240 as their base model the Z300 and VZ300 have been tuned up with new technologies like an intake cooling system and exhaust pressure reduction system to achieve higher power output. The Yamaha HPDI system adopted on the Z300 and VZ300 is one that uses a pressure of about 70 times atmospheric pressure to inject finely atomized fuel directly into the cylinder to achieve highly efficient combustion. This enables easier atomization/vaporization than a conventional direct injection system to produce highly efficient combustion and greater power output as a result. Another feature of the Z300 and VZ300 is the YDIS (Yamaha Diagnostic System) by which the motors ECU can be connected to a PC to find any mechanical failure or check information about the motors history of mechanical failures. There are also fail-safe functions that enable continued engine operation at slower speed even if failure should occur in some part of the system or its sensors.